Versatile sleeping options for one or two persons. 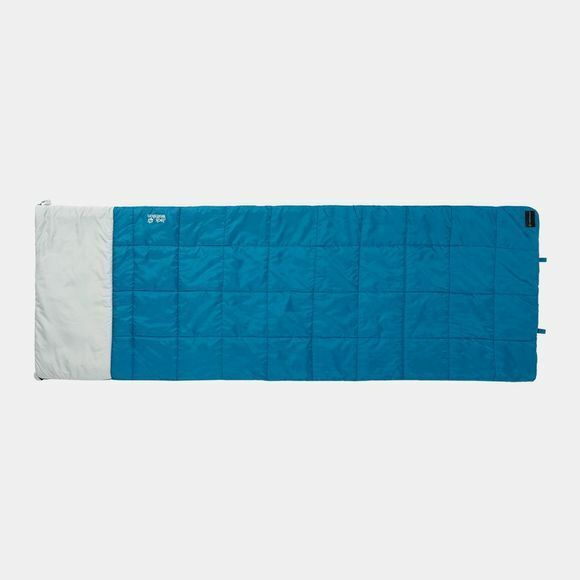 Jack Wolfskin's 4-in-1 Blanket is a versatile rectangular sleeping bag combined with a zipped-in liner. Use it like a sleeping bag and the liner protects the sleeping bag so it requires less frequent washing. The liner can also be used on its own as a lightweight hut bag. If you open out, it becomes a summer sleeping bag for two. With the liner at the bottom, the blanket section keeps you warm. Turn it over and you can lie comfortably on the blanket section with just the thin liner as a cover – a great option for warmer weather. The sleeping bag has an adjustable thermal collar. Folded inwards, it provides additional insulation. On warmer nights, simply fold it out, allowing warm air to escape and fresh air to enter at the shoulders. When in double sleeping bag mode, it acts as a second pillow. The 4-in-1 Blanket has a single layer of moisture-insensitive Microguard synthetic insulation. Cold-sensitive areas feature additional insulation. This gives it a comfort temperature rating of +5°C.